Sharp has announced that it has developed a TV Tuner that complies with the Chinese terrestrial digital broadcast specifications. 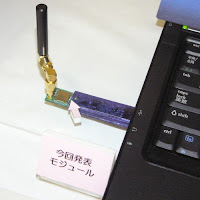 The device can be said to be an HDTV tuner for mobile device applications since the Chinese digital broadcast format can use HDTV signals without converting them. The Sharp TV tuner can be used with USB tuners targeted at PCs and PDAs. Sample batch of the device will be shipped in January 2008 and volume production will start at the end of March 2008. Price is around $270.